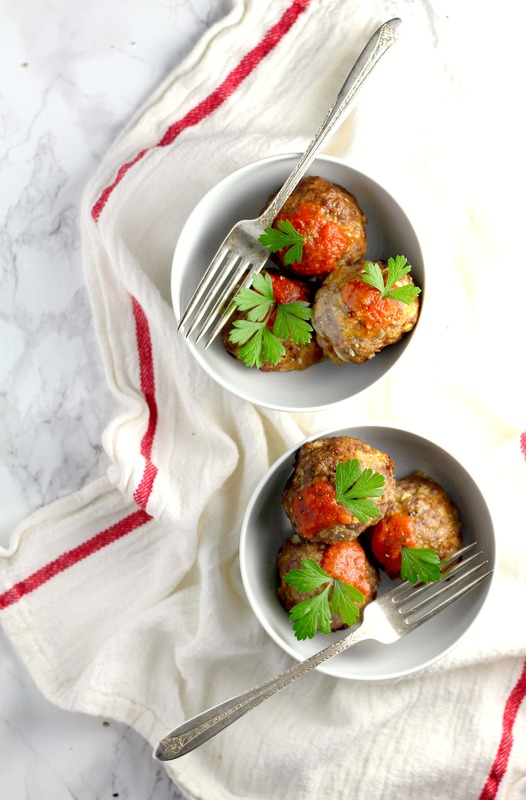 This Meatball Recipe will make you tender, delicious flavorful meatballs you can use as dinner dishes, sandwiches or appetizers. When you have a recipe this good and this versatile you’d be crazy not to use it often. And you will use it often because it’s made with burger so it’s cost effective, affordable, budget friendly and well let’s just say it ok, it’s cheap. A cheap dinner, sandwich, appetizer or casserole made with this Meat Ball Recipe that can’t help but taste like a million bucks! How many different ways can I use this recipe? Meatball Subs – Make the meatballs in advance and keep them in the fridge to use and make Meatball subs for dinner, or football games. Simmer them in your favorite tomato sauce until your ready to serve them. Put the meatballs in sub rolls, top with grated Mozzarella and Parmesan, maybe a little chopped basil and broil until the cheese is melted. Meatball Casserole – you may want to make them a little smaller for a casserole, maybe half the golf ball size in the recipe, adjust the baking time accordingly to about half for the meatballs Use your favorite pasta shape, spaghetti sauce and cheeses to make a delicious casserole that will be quick and easy with the meatballs made up in advance . Game Day Appetizers – Your favorite slider rolls along with this Meatball Recipe, the cheese of your choice topped with a dab of tomato sauce and baked until the cheese is melted. I mean, who wouldn’t love that on game day. The ingredient list for this delicious Meatball Recipe is simple short and packed full of flavor. Roll the hamburger into balls that are a little bit bigger than a golf ball. Place them in a 13×9 inch baking dish one inch apart that has been either coated lightly with oil or lined with a piece of foil that has been coated with oil or sprayed lightly with baking spray so they don’t stick to the pan. Bake the meatballs in a preheated 400 degree oven for about 25 minutes or until they are no longer pink in the middle. I can’t make these without eating at least one, usually two ,when they come out of the oven. They are so tender and incredible flavorful. They can’t help but be flavorful, the ingredient list is packed full of flavor. Get your creative juices flowing and make something, anything with this delicious Meatball Recipe. And if you’ve made something I haven’t thought of, TELL ME ABOUT IT!! I wanna make it too! Meatball Recipe, your going to love it for so many delicious reasons, Enjoy! This delicious Meatball Recipe is tender , delicious and full of flavor. Perfect for making and using them to make casseroles, sub sandwiches and sliders. Heat oven to 400 degrees. Line a 13x9 inch baking dish with foil and either rub oil lightly over it or use a cooking spray. You can also just oil a 13x9 inch pan lightly if you don't want to use the foil. Place all the meatball ingredients in a large bowl and mix well. Shape the burger into balls a little bigger than a golf ball. I was able to get 8 meatballs from the recipe. Place them in the baking dish leaving some space in-between them. Bake uncovered for 18 - 22 minutes or until no longer pink in the middle. Looking For More Meatball Recipes, Try These From Other Bloggers.